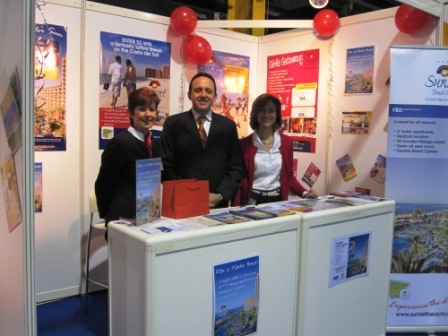 The Holiday World Show in Belfast 2013: The Perfect Place to Plan Your Next Holiday! 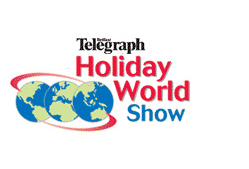 If you’re planning a holiday this year (2013) and are anywhere near Belfast, you wont want to miss the fantastic Holiday World Show which will be held at the King’s Hall Exhibition and Conference Centre. With all the latest in cruise deals, adventure travel, holiday destinations and other fabulous holiday ideas, you’re bound to find a great deal for your next getaway! We’re definitely in “wedding mode” at the moment and this weekend is no exception with the Bride of the Year Show at the RDS in Dublin. 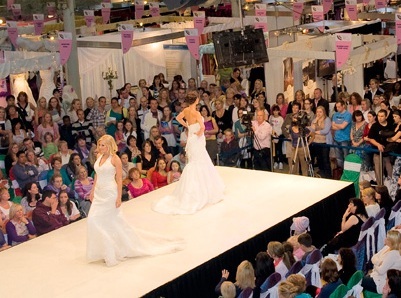 This is actuallyIreland’s longest established wedding show – since 1989 – and one of the most popular wedding shows of the year. Holiday World Belfast 2012: Our 2nd Show of the Year! On Thursday morning I’ll be jumping on a plane heading toBelfast. It’s my turn to set up for the next show on our busy 2012 schedule; the Holiday World Show in Belfast’s King’s Hall. 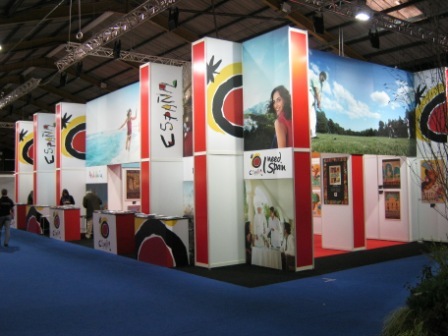 With the Christmas and holiday period behind us and the New Year in full swing, we are getting ready to attend a series of Trade Shows and Fairs in the Uk and Ireland. 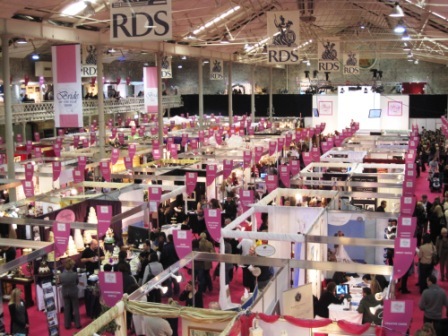 First up on our busy calendar for January is the Wedding Journal Show 2012 which will be held at the Citywest Hotel and Convention Centre in Dublin! Regarded a Ireland’s largest wedding event, The Wedding Journal Show is perfect for brides and grooms planning their big day; the wide selection of exhibitors and suppliers will help provide inspiration and ideas for the perfect wedding. Sunset Beach Club will also be present at the show. 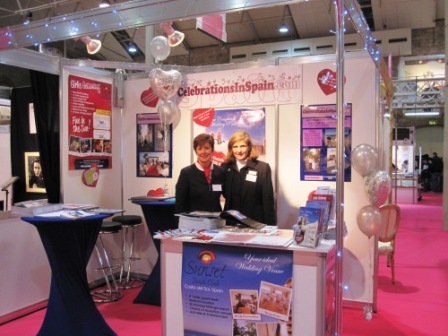 Melissa from our Commercial department and Kerry, our wedding planner, will be manning our stand (nº E10) during the show and will be happy to answer any questions or queries you may have about getting married in Spain. Don’t forget to stop by our stand and enter our prize draw for a chance to win a Romantic 3 Night Winter Break at Sunset Beach Club! For more information or to make a private appointment with our wedding planner during the show, please email Melissa on m.palmer@sunsetbeachclub.com . You can also find more information about Spanish Weddings on our website. It’s busy, busy in Sunset Beach Club’s commercial department. As I write this post, Melissa is desperately trying to squeeze brochures into her Ryanair-friendly suitcase as she prepares for the Wedding Journal Show which will be held at the Citywest complex inDublinthis weekend. The show is open to the public on Saturday the 24th and Sunday the 25th September with opening hours from 11am to 6pm on both days. Brides, bridesmaids and even bride’s mums will be able to get advice on how to look best for the special day by going along to the Style Stage where a team of expert stylists will help you find the perfect look! So if you’re planning on getting married and are thinking of choosing Sunset Beach Club to celebrate your wedding, be sure to stop by the Show and have a chat with Melissa who will be at stand E11; you could win a 3 night romantic break to Sunset Beach Club!! 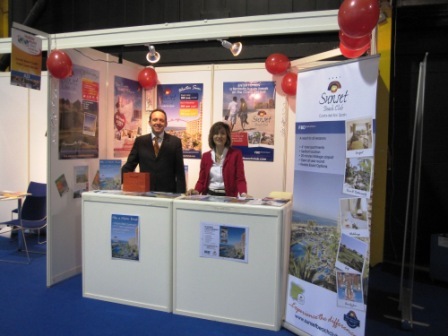 Summer is almost over and our busy season of trade fairs and exhibitions is about to begin. This weekend, Annemie and Melissa are off to the Wedding & Honeymoon Show which will be held at the RDS in Dublin on Saturday the 3rd and Sunday the 4th September, 2011. Apparently, the show was a great success last year with thousands of visitors attending; this year, over 200 wedding specialists will be exhibiting the latest ideas and trends to help you plan and organise the perfect wedding day! 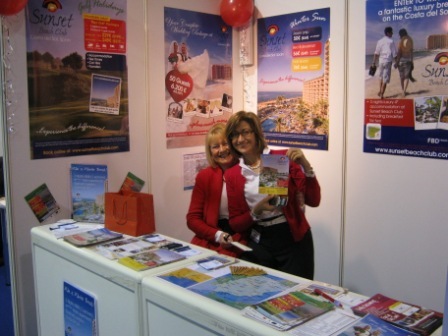 If you’re planning on visiting the show, make sure you stop by the Sunset Beach Club stand (nº F9) where Annemie and Melissa will be able to give you lots of useful information about getting married in Spain and about the fantastic wedding facilities we have available; be sure to ask for our latest wedding packages, you’ll be amazed at their incredible value! Make sure you enter our competition whilst you’re there and you could win a Romantic 3 day winter break at Sunset Beach Club! 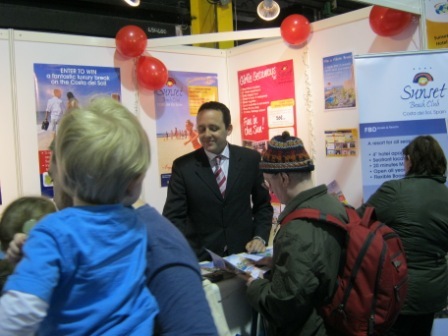 The Wedding & Honeymoon Show starts at 11.30 am and ends at 5.30 pm on both Saturday and Sunday. Chelo and Melissa from the Commercial Department will be heading off to Belfast on Friday to attend two popular exhibitions: The Over 50’s Show and the Wedding Journal Show. Chelo will be looking after the Sunset Beach Club stand at the over 50’s show which will be held at the Ramada Hotel in Shaws Bridge. 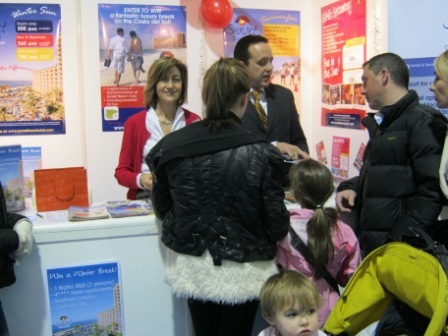 Anyone thinking of booking a great value holiday should stop by the stand and speak to Chelo as we have some great offers for March! The show is open to the public on Saturday 26th February, from 10am to 6pm and Sunday 27th February, from 11am to 6pm. The ever popular Wedding Journal Show will be held at the King’s Hall. 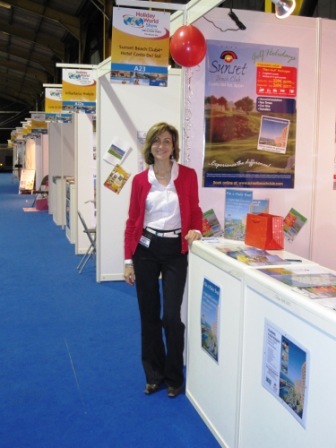 Melissa will be available to meet visitors at the Sunset Beach Club stand (nºD10). With fantastic offers for Hen Parties and Full Wedding Packages, it’s a must see for anyone looking to get married in Spain. 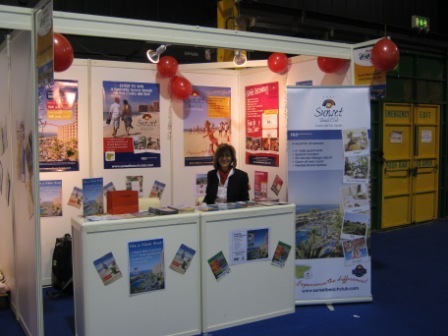 Don’t forget, you can win a 3 night break at Sunset Beach Club by visiting the show stands and entering the prize draw!!!! My colleagues Claire, Chelo and I have just got back from a busy (and cold) weekend in Dublin! 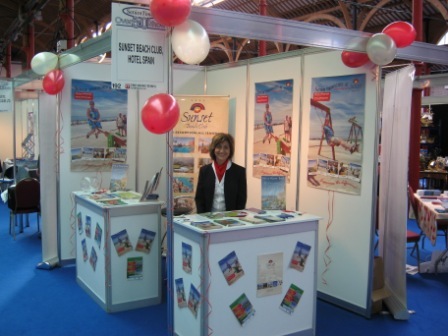 Chelo and I attended the Holiday World Show at the RDS where Sunset Beach Club had a stand (see photos) whilst Claire helped man the “Celebrations in Spain” (Our wedding planners) stand at the Bride of the Year Show at the RDS. Here’s a few photos taken at both of the shows……. Claire, our Wedding and Events coordinator just got back from a – very cold – trip to the Danish capital, Copenhagen. With temperatures of minus 2 ºC outside, it’s just as well she was tucked away in the – relative – warmth of the Bella Exhibition Centre! 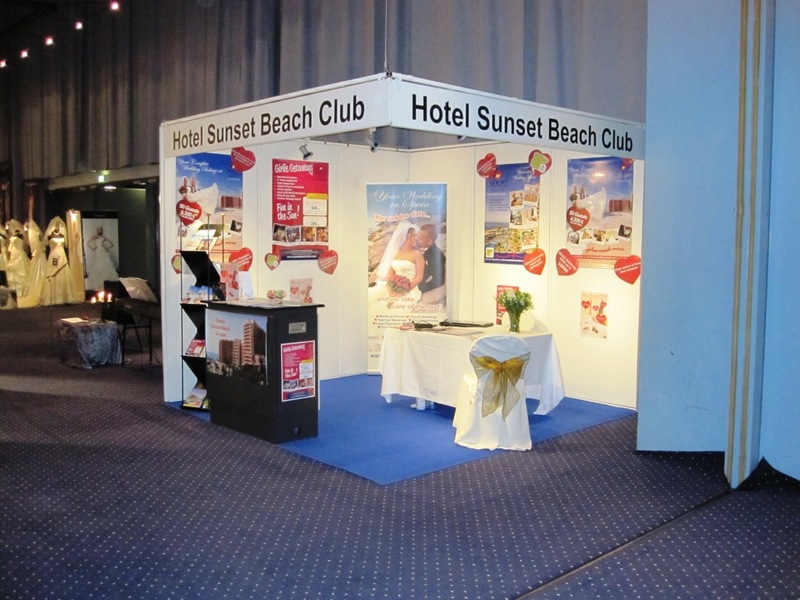 As mentioned in a previous post, this is the first time that Sunset Beach Club has invested in a stand at this Scandinavian Wedding Show, showcasing modest wedding dresses; I’m pleased to report that it was a great success! Claire wasn’t quite sure of the reaction we would get and was pleasantly surprised at the fantastic response. With 104 stands at the show, we were lucky to get a prime spot of real estate with exclusive homes in Sea Pines, Hilton Head;(see photo of stand) our stand was near the main entrance and a catchment area for inquisitive visitors. Another positive point was that we were the only stand from a foreign country which, inevitably, aroused a high level of curiosity. Although the show was targeted at, soon to be married, brides and grooms – and we had some very interested couples – it also allowed us to market the rest of our hotel’s fantastic facilities and services for regular holidays to the Costa del Sol; we’ll hopefully get a few more Danes coming to enjoy golf and sunshine at Sunset as a result. 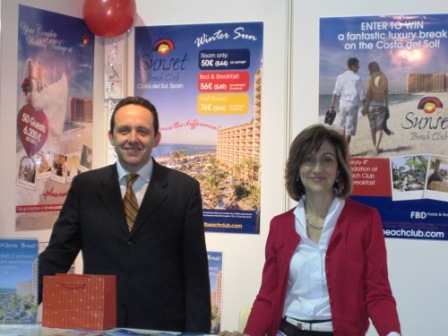 Michael Orlien, the Chairman for the Sunset Beach Club owners committee, who is actually from Copenhagen very kindly offered to help Claire at the stand over the weekend and did a fantastic job in helping us sell the Sunset experience (Thanks for your help Michael J). One of the most “talked about” topics at the show was the price of our winter wedding packages……. Visitors to the stand could not believe their great value. 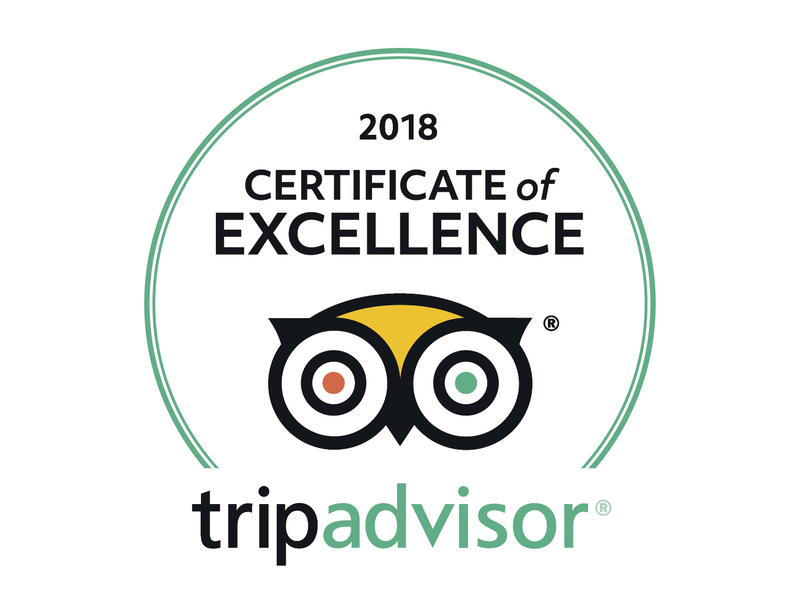 They all kept asking if the price we advertised was just for the meal; they were literally gob smacked when they found out it included all wedding day details: Photographer, wedding planner, bridal suite, hair and makeup for the bride….and the list goes on!